USAID’s Office of Health Systems (OHS) tracks health indicators for low- and middle-income countries, including indicators for maternal, neonatal, and child health, family planning, and HIV and AIDS. 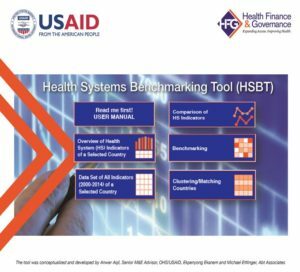 The Health System Benchmarking Tool (HSBT) helps to standardize this tracking process and provide answers to emerging policy and programmatic questions. The HSBT is designed for health system managers and administrators, policy makers, and monitoring and evaluation experts. It can highlight a health system’s strengths and weaknesses, especially when compared against other countries with similar socio-economic, demographic, or gender empowerment characteristics. It focuses on the three Bureau of Global Health priority initiatives by including relevant indicators on Ending Preventable Child and Maternal Deaths (EPCMD), AIDS Free Generation, and Protecting Communities from Infectious Disease. The tool provides an option to specifically benchmark EPCMD countries using health system outcomes and impact indicators. A unique feature of the tool is its clustering function. Users can match countries’ socio-economic characteristics to control for their effects before comparing health system indicators. The Excel-based tool can be downloaded to be accessed offline. The tool displays data sets for 142 countries covering socio-economic, demographic and gender and health system functions, outcomes and impact indicators (2000-2014). The tool allows for comparison of indicator(s) over time by countries, countries within regions, and countries by income groups. It recognizes trends in health system indicators from 2000 to 2014. It can identify countries with best and worst health system indicators by region, income group, or by a selected group of countries. The data set can be imported in any statistical software for inferential analysis. Donors and country health planners need to compare health system performance of countries and administrative units to identify performance, the best and to make investments, planning and management decisions. However, there previously were no global tools available for benchmarking health system functions, outcomes and impact. The Health System Benchmarking Tool fulfills that need.